Probably the most effective way to gain an understanding of Unitarianism is to attend a worship service. If you find that you respond to the atmosphere, feel welcome and included and react favourably to the ideas and attitudes that are conveyed, you may discover that Unitarianism is for you – in fact, you may come to realise that for a long time you have been a Unitarian without knowing it. Unitarianism is a non-credal faith. We are united by love and respect, not by our individual beliefs. You can find out more about our ethos and our own members’ theologies by visiting the “Unitarian?” section of this site. Regular worship is held on Sundays at 10.45am and Wednesday lunchtimes at 1.00pm, with tea and coffee following. To find our more about our services, and what to expect, visit our services page. There has been a chapel on this site since 1694, but the current building dates from 1997. It may not look like a chapel on first sighting. It consists of the first two floors of a modern office block. However, once inside, you will find that it offers a peaceful spiritual oasis in the city centre. 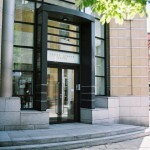 Our ground floor is wheelchair accessible, with a ramp to the left of the front steps. 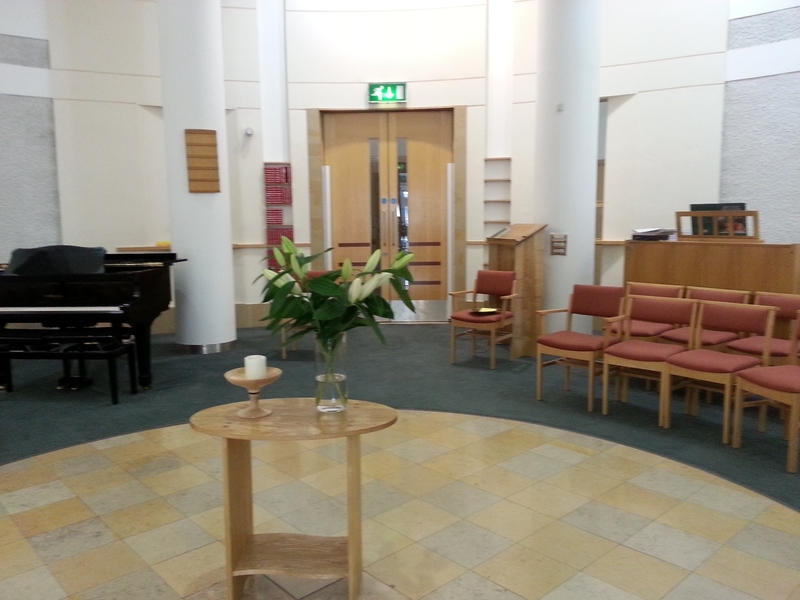 The modern, circular chapel provides for varied, contemporary worship, occasional music concerts and other events. It has a seating capacity of up to 170. You may stroll on the concourse, browse at our literature table or simply sit quietly in the chapel, in silence or listening to some music. 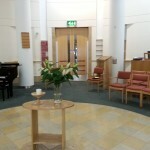 The chapel includes a number of other rooms, which are available for hire. For more information, see our lettings page. Our history wall; created for our 350th anniversary in 2012. The congregation dates from 1662 – the year of the Act of Uniformity. This act required all clergymen to abide stricly by the requirements of the Book of Common Prayer. Some 2000 clergymen refused, and were ejected from their livings. One of them was Rev. 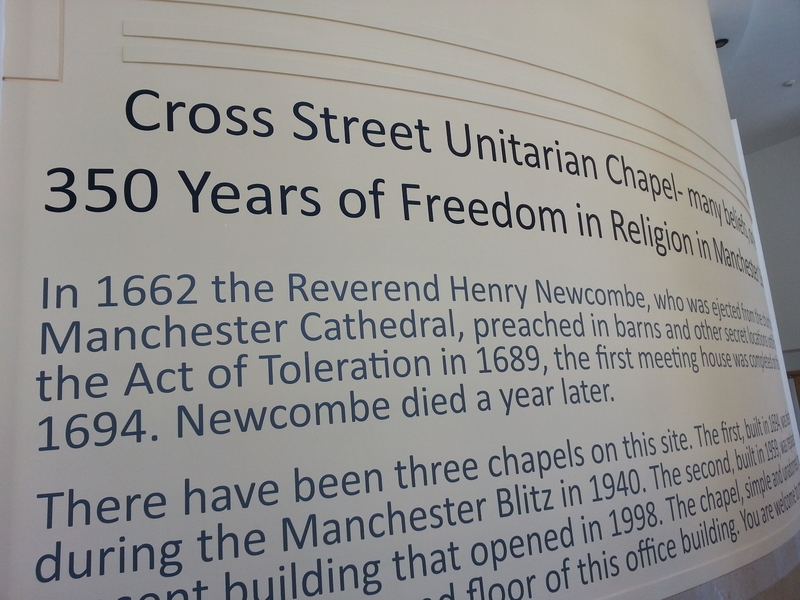 Henry Newcome, whose followers eventually built a place of worship of their own, the first of its kind in Manchester. 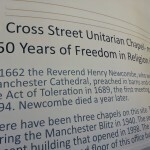 This Dissenters’ Meeting House, later to be known as Cross Street Chapel, was opened in 1694 and is the parent church of non-conformity in Manchester. Throughout its history, those who attended and adhered to it have made a remarkable contribution to liberal religion, social reform and the civic, cultural and public life of the city. The original chapel was destroyed by enemy action in 1940. Its 1959 replacement was succeeded in 1997 by our new suite of premises, designed to meet the needs of the twenty-first century. Among those who have been associated with the Chapel in the past, we remember particularly the novelist Elizabeth Gaskell whose husband William was minister at Cross Street Chapel for fifty-six years (1828 to 1884). The Gaskell Society continues to meet here regularly. The Gaskell Room in the Chapel has a collection of memorabilia including early editions of her novels. If you are looking for detailed records (births, marriages, deaths), please contact the Unitarian Historical Society. 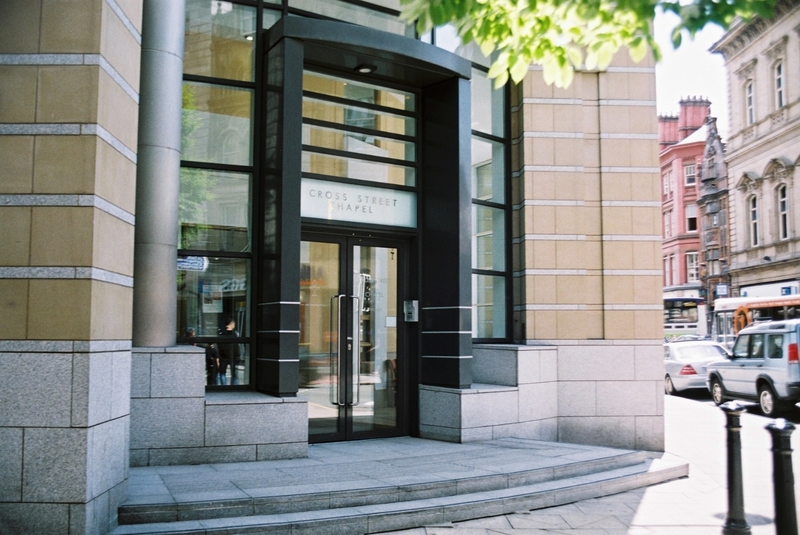 Many of our records are held in the Manchester Archives Hub or at the John Rylands University Library.